Georgia Peaches…Simply delicious! 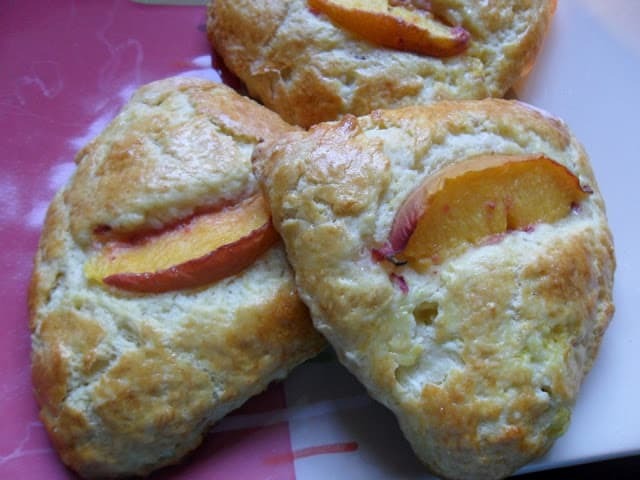 While visiting my daughter and her family in Athens GA, I thought it appropriate to whip up a batch of buttermilk scones using fresh Georgia peaches. Fresh, chopped peaches are added to the dough. After the dough is formed into triangular scones, a thin peach slice is placed on the top of each scone and lightly pressed into the top. The scones are baked, cooled and drizzled with a white chocolate glaze. The first time I experienced a fresh, juicy, warm Georgia peach was when my husband and I were on vacation. We were driving through Georgia on our way to Florida. It seemed like we had been driving for days, when in fact we had been. We had left Wisconsin the day before, stopped in ‘Where in the Hell Are We, Illinois’ and stayed at a No-tell Motel for the night. We didn’t get much sleep, so by the time we got to the southern portion of Georgia we were tired, crabby and hungry. We stopped at a Shell gas station, straight out of the 1950’s. I went inside to get the key for the bathroom. I felt like I was entering the Twilight Zone. As we were leaving, we saw a huge homemade sign with the word Peaches painted on it and a red arrow pointing in the direction we were going. A few miles down the highway, there was an old rickety wooden stand that I was sure would fall over if a strong wind blew through the area, let alone a hurricane. My hubby pulled the car over to the side of the road and we got out. Before we got all the way up to the stand I could smell peaches. I’ve never smelled fresh peaches like that before, it was intoxicating. We bought two dozen peaches that day and ate every last one. Our hands and face were sticky. Peach juice was dripping off of our chins. I have never tasted a peach that good before. After that day, I knew exactly what the difference was between a peach and a Georgia peach. 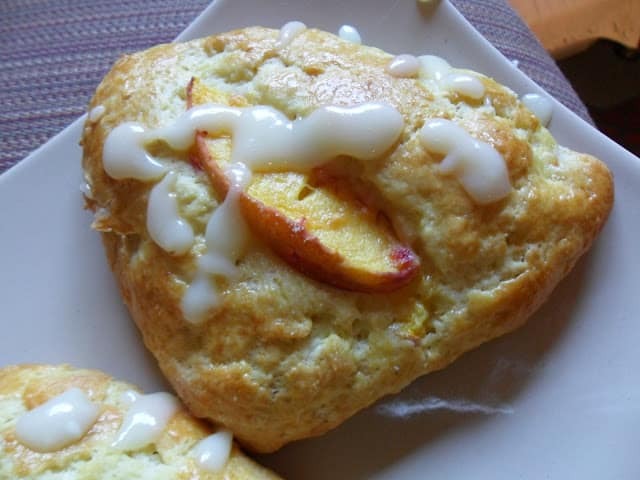 Buttermilk Peach Scones are delicious on there own but a drizzle of melted white chocolate never hurt..
A delicious scone made with fresh Georgia peaches and topped with a white chocolate glaze. In large bowl, mix flour, sugar, baking powder, and salt. Cut in cold, cubed butter until mixture resembles coarse crumbs. In a small bowl, combine 2 tablespoons beaten egg, buttermilk and almond extract. (Reserve left over egg for wash.) Add to dry ingredients, mix just until moistened. Fold in chopped peaches. Turn onto a floured surface, knead gently 6 to 8 times, kneading in a small amount of flour if needed. Pat dough into a 6 inch circle. Cut into 8 wedges, separate. Place on baking sheet, lined with parchment paper. Brush tops with reserved beaten egg. 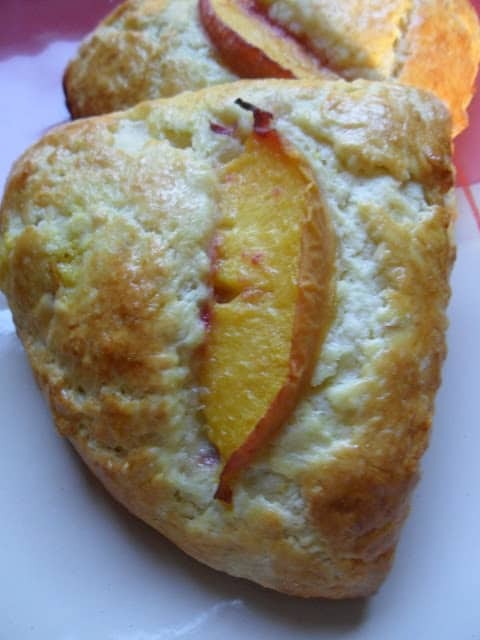 Place a thin slice of peach on top of each scone, pressing peach into scone lightly. Bake at 425º for 12 to 15 minutes or until golden brown. Place white chocolate chips in a small glass bowl, microwave for 20 seconds; stir. Add 1 to 2 teaspoons milk, buttermilk, or cream. Stir. Microwave 10 to 15 seconds longer, stir until smooth. Drizzle over scones. Rhubarb Banana Sourdough Scones with Lemon Glaze is another fantastic scone recipe you need to try. Made with fresh rhubarb, mashed bananas and topped with a lemon glaze. Hi, I am visiting via Moonshine Monday. Scones are the best thing ever invented, ever and your look absolutely delicious! I cannot wait for peach season. Your scones look fantastic! I'll be featuring them on Thursdays Treasures. Everything about this sounds delicious…buttermilk, peaches, white chocolate. What a treat! Thank you for linking w/ See Ya in the Gumbo this week, Lynn. Wanted to let you know that your scones are in the top five "most viewed" this week. They will be featured when See Ya in the Gumbo goes live this evening! I'll take Two Please! Thanks for sharing on Show Me Your Plaid Monday's!!! I'm over from Honeysuckle..and linking up to follow you. These would just melt in my mouth. Your recipe is awesome and thank you so much for sharing it at the table with Full Plate Thursday. Hello I am your newest follower from the blog hop on your blog would love for you to follow me back. Thanks 🙂 Feel free to Like or Follow me on my other media sites!!! yumO.these look amazing,I'll take 1/2 dozen. Hey I'm here following back.Thanks for your sweet comment an I look forward to having lots of bloggy fun wit ya.